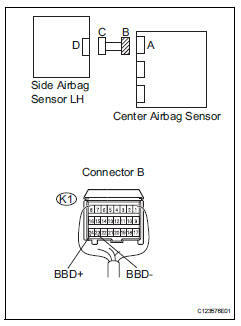 The side airbag sensor lh consists of part including the diagnostic circuit and the lateral deceleration sensor. 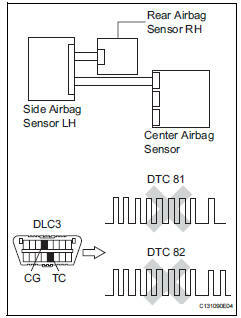 Dtc b1643/81 is set when a malfunction is detected in the side airbag sensor lh circuit. Check the dtcs (see page rs-49). Ok: dtc b1622/81 is not output. 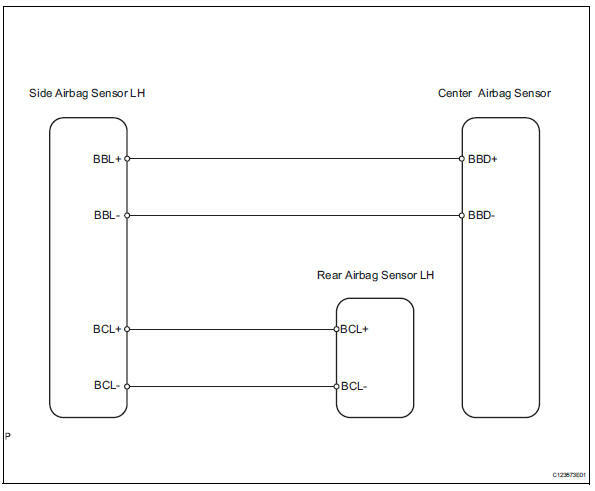 Dtc b1632/81 is not output. Dtcs other than dtc b1622/81 and b1632/81 may be output at this time, but they are not related to this check. Disconnect the cable from the negative (-) terminal battery, and wait for at least 90 seconds. 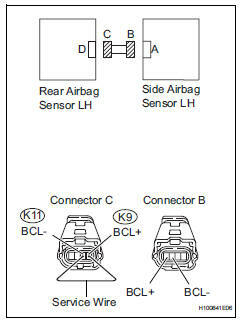 Check that the connectors are properly connected to the center airbag sensor, rear airbag sensor lh and the side airbag sensor lh. Disconnect the connectors from the center airbag sensor and the side airbag sensor lh. 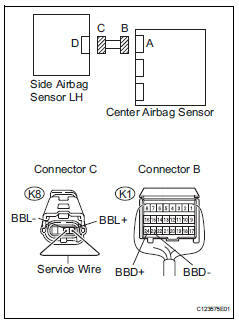 Using a service wire, connect k8-4 (bbl+) and k8-3 (bbl-) of connector c.
Disconnect the connectors from the side airbag sensor lh and the rear airbag sensor lh. 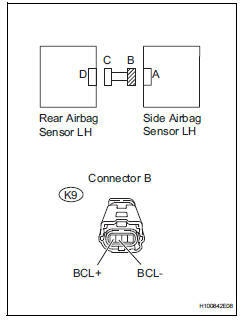 Using a service wire, connect k11-1 (bcl-) and k11-2 (bcl+) of connector c.
Connect the connectors to the center airbag sensor . 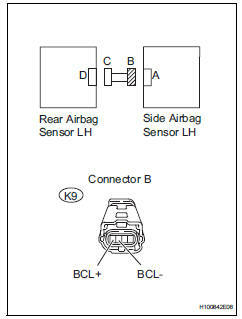 Interchange the side airbag sensor lh with the side airbag sensor rh and connect the connectors to them. 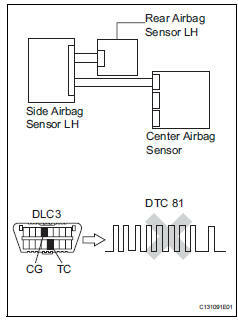 Dtcs other than dtc b1643/81 and b1648/82 may be output at this time, but they are not related to this check. 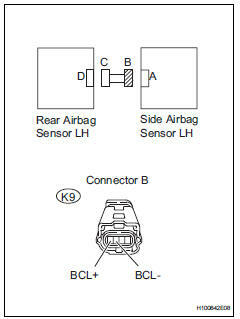 Interchange the rear airbag sensor lh with the rear airbag sensor rh and connect the connectors to them.